The Ritz-Carlton Hotel Company, L.L.C., part of Marriott International, Inc. announced its entry into luxury yachting and cruises on June 22, 2017 – bringing the award-winning luxury hotel brand’s service and timeless style to sea. Created by The Ritz-Carlton and maritime experts Douglas Prothero and Lars Clasen, in collaboration with funds managed by Oaktree Capital Management, L.P., The Ritz-Carlton will provide luxury hospitality service under a long-term operating agreement. 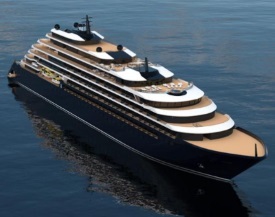 Named The Ritz-Carlton Yacht Collection, this venture represents a unique foray into the cruise industry for a luxury hotel operator. The lavish cruising yachts in this series distinguishes Marriott International as the only provider of luxury accommodations both on land and at sea. Since their announcement in 2017, Ritz-Carlton experienced an eventful year of notable development and innovation milestones during 2018 leading up to what should be a celebratory and defining inaugural year for their new venture with luxury yachting and cruises. It is an exciting time for their brand and organization. 2018 January – They began the building process. 2018 March – The Shore Collection excursion categories were developed. 2018 April – The voyages were announced for the inaugural season. 2018 June – 2020 inaugural season was open for reservations. 2018 October – The inaugural yacht splashes down. 2018 December – The name of the first yacht is revealed. Celebrating the milestones and first time in the water with first yacht, Azora. That is Ritz-Carlton's personal invitation for travelers to set sail on a journey of discovery in 2020 and beyond on their new Ritz-Carlton Yacht Collection. Reservations are now open for the 2020 inaugural season. They announced the name of their inaugural yacht on December 5th, 2018 at the International Luxury Travel Market in Cannes, France. The first yacht will be named Azora, meaning “sky blue”, a word of Spanish origin derived from “azure” and the color “azul”. Evoking the beauty of the sky and the ocean, Azora is a name that encourages guests to immerse themselves in the color of travel and experience the world with The Ritz-Carlton Yacht Collection. Set sail on a journey of discovery with The Ritz-Carlton Yacht Collection. Designed to combine the luxury lifestyle of The Ritz-Carlton and the casual freedom of a yachting vacation, The Ritz-Carlton Yacht Collection will offer bespoke voyages on three custom-built yachts in 2020. Most voyages range from seven to ten nights, offering many overnight calls and uniquely curated experiences ashore. 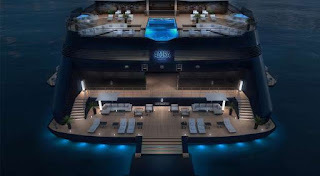 Compared to commercial cruise liners that typically host 2,000 – 5,000 passengers, each Ritz-Carlton yacht will feature 149 suites, each with its own private terrace, and accommodate up to 298 guests in a relaxed, casually elegant atmosphere. As with The Ritz-Carlton on land, each yacht will feature personalized service, elevated dining and luxury amenities. A voyage with The Ritz-Carlton Yacht Collection offers an unprecedented opportunity to be untethered. Here, freedom and flexibility allow immersion in life's exceptional experiences; exploration of earth's exquisite and unexpected hideaways; and stirring of passions and curiosities that create new and deepened connections. All of this delivered in an intimate setting with a heightened level of care and attention. Enlivened and enlightened, marvel at the beauty of the world though fresh eyes. Live untethered, live fully. Perhaps it can be said The Ritz-Carlton has come full-circle with their business history in the hospitality industry. The story of The Ritz-Carlton begins with Swiss hotelier Cesar Ritz, who was well known in the hotel industry as the "king of hoteliers and hotelier to kings" redefined luxury accommodation in Europe with his management of The Ritz in Paris and the Carlton Hotel in London, among others. He and the renowned chef from his hotels, Auguste Escoffier, opened a la carte restaurants known as Ritz-Carlton on board the Hamburg-Amerika Line ocean liners SS Amerika in 1905 and SS Imperator in 1913. The restaurants on those ships ceased operating in 1914 with the outbreak of World War I. Although Ritz died in 1918, his wife Marie continued the tradition of opening hotels in his name.Today, The Ritz-Carlton is owned by Marriott International. Secrets of a Thriving Hotel magazine wishes the best of luck and safe travels to The Ritz-Carlton Yacht Collection. Congratulations on having a memorable 2018! May you experience many more milestones in the life of your business with each new voyage! sources: The Ritz-Carlton Press Release(s), The Ritz-Carlton Yacht Collection Website, The Ritz-Carlton Vimeo Website, and Wikipedia.